Brother | Where is @rusnivek? Every year, I share one picture from September 11. I took this particular picture because it is the home of Engine-10 and Ladder-10 who’s station sits in the shadow of the former World Trade Center. Yes, that’s right – directly next to the World Trade Center. 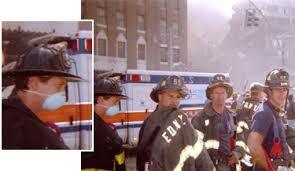 I remember digging at the pile with my fellow FDNY Brother Firefighters in the pile searching for something. I really wish we had found something significant to give to any family member. When I look back, I struggle with that particular memory. So take some time out of your day to think about Firefighters and others who lost their lives on that day. No doubt, America continues to heal 17 years later. Also, 2018, take some time to think about those public safety pros headed into harms way to ensure safety for those in the path of so many deadly hurricanes. Yes, we will never forget the sacrifices. We will always continue to fight the good fight. America the beautiful, my home of the brave. Thank you to FDNY, HBO, and Brother Steve Buscemi.